Beata Margareta Kristina Söderbaum (5 September 1912 – 12 February 2001) was a Swedish-born German film actress, producer, and photographer. She is most known for her roles in Nazi-era films. Born in Stockholm, Sweden; her father, Professor Henrik Gustaf Söderbaum (1862–1933), was the permanent secretary of the Royal Swedish Academy of Sciences. Henrik Gustaf Söderbaum was a Swedish chemist and secretary of the Royal Swedish Academy of Sciences from 1923 to 1933. After both her parents had died shortly after each other, she moved to Berlin and enrolled in a theatre school. Veit Harlan was a German film director and actor. Rassenschande or Blutschande was an anti-miscegenation concept in Nazi German racial policy, pertaining to sexual relations between Aryans and non-Aryans. It was put into practice by policies like the Aryan certificate requirement, and later the Nuremberg Laws, adopted unanimously by the Reichstag on 15 September 1935. Initially, these laws referred predominantly to relations between Germans and non-Aryans. In the early stages the culprits were targeted informally, and then later on punished systematically by a repressive legal apparatus. Jud Süß is a 1940 Nazi propaganda film produced by Terra Film at the behest of Joseph Goebbels, and considered one of the most antisemitic films of all time. The film was directed by Veit Harlan, who wrote the screenplay with Eberhard Wolfgang Möller and Ludwig Metzger. The leading roles were played by Ferdinand Marian and Harlan's wife Kristina Söderbaum; Werner Krauss and Heinrich George played key supporting roles. Immensee: ein deutsches Volkslied is a German film melodrama of the Nazi era, directed in 1943 by Veit Harlan and loosely based on the popular novella Immensee (1849) by Theodor Storm. It was a commercial success and, with its theme of a woman remaining faithful to her husband, was important in raising the morale of German forces; it remained popular after World War II. Opfergang is a 1944 German film directed by Veit Harlan. It is based on Rudolf G. Binding's work of the same title, with alterations for propaganda purposes. The Great King is a 1942 German drama film directed by Veit Harlan and starring Otto Gebühr. It depicts the life of Frederick the Great, who ruled Prussia from 1740 to 1786. It received the rare "Film of the Nation" distinction. It was part of a popular cycle of "Prussian films". In the first few years after the war, Söderbaum was often heckled off the stage and even had rotten vegetables thrown at her. In subsequent years, she frequently expressed regret for her roles in anti-semitic films. After her husband was again permitted to direct films, Söderbaum played leading roles in a number of his films. These included Blue Hour (1952), The Prisoner of the Maharaja (1953), Betrayal of Germany (1954), and I Will Carry You on My Hands (1958). Their last joint project was a 1963 theater production of August Strindberg's A Dream Play in Aachen. After Harlan's death in 1964, Söderbaum became a noted fashion photographer. In 1974 she took a role in Hans-Jürgen Syberberg's film Karl May. In 1983 she published her memoirs under the title Nichts bleibt immer so ("Nothing Stays That Way Forever"). In her later years, Söderbaum faded into obscurity but still took roles in three movies and the television series The Bergdoktor. Her last film was with Hugh Grant in the thriller Night Train to Venice in 1994. She died in 2001 in a nursing home in Hitzacker, Lower Saxony, Germany. Blood and soil is a nationalist slogan expressing Nazi Germany's ideal of a "racially" defined national body ("blood") united with a settlement area ("soil"). By it, rural and farm life forms are not only idealized as a counterweight to urban ones, but they are also associated with an imaginary and sedentary Germanic-Nordic peasantry which is placed in opposition to an anti-Semitic trope of Jewish nomadism. It is tied to the contemporaneous German concept of Lebensraum, the belief that the German people needed to reclaim historically German areas of Eastern Europe into which they could expand. Olga Konstantinovna Chekhova, born Knipper (Russian: Ольга Константиновна Чехова was a Russian-German actress. Her film roles include the female lead in Alfred Hitchcock's Mary. Refugees is a 1933 German drama film directed by Gustav Ucicky and starring Hans Albers, Käthe von Nagy and Eugen Klöpfer. It depicts Volga German refugees persecuted by the Bolsheviks on the Sino-Russian border in Manchuria in 1928. The Immortal Heart is a 1939 German drama film directed by Veit Harlan and starring Heinrich George. It was based on Walter Harlan's play The Nuremberg Egg and depicts the inventor of the watch, Peter Henlein. Frieda Ulricke "Henny" Porten was a German actress and film producer of the silent era, and Germany's first major film star. She appeared in more than 170 films between 1906 and 1955. The Comedians is a 1941 German drama film directed by Georg Wilhelm Pabst, and based on the novel Philine by Olly Boeheim. The film is set in the eighteenth century, and portrays the development of German theatre. Ich klage an is a 1941 German pro-euthanasia propaganda film directed by Wolfgang Liebeneiner. Die goldene Stadt, is a 1942 German film directed by Veit Harlan, starring Kristina Söderbaum, who won the Volpi Cup for Best Actress, and in Agfacolor. The Stars Shine is a 1938 German musical revue directed by Hans H. Zerlett and written by Zerlett and Hans Hannes. The Journey to Tilsit is a 1939 German drama film directed by Veit Harlan and starring Kristina Söderbaum, Philip Dorn and Anna Dammann. Uncle Bräsig is a 1936 German comedy film directed by Erich Waschneck and starring Otto Wernicke, Heinrich Schroth and Harry Hardt. 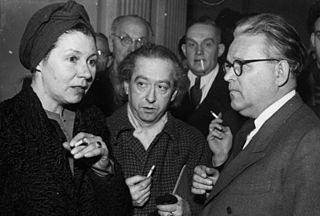 It marked the film debut of the Swedish actress Kristina Söderbaum who went on to be a major star of Nazi cinema. Söderbaum won her part in a contest organised by UFA. It was based on the novel Ut mine Stromtid by Fritz Reuter. To New Shores is a 1937 German drama film directed by Hans Detlef Sierck and starring Zarah Leander, Willy Birgel and Viktor Staal. It was Leander's first film for the German studio UFA, and its success brought her into the front rank of the company's stars. It was shot at the Babelsberg Studio in Berlin. Premiere is a 1937 Austrian musical crime film directed by Géza von Bolváry and starring Zarah Leander, Attila Hörbiger and Karl Martell. The wealthy backer of a Viennese musical revue is murdered on the first night of the show. It was Leander's first German language role after previously appearing in Swedish films. On the basis of her performance in the film, Leander was signed by the German Major studio UFA after their major rival, Tobis, had decided she had insufficient star appeal. Her next film To New Shores established Leander as the leading star in Germany. Hitler's Heroines: Stardom and Womanhood in Nazi Cinema is a 2003 book written by Antje Ascheid. ↑ Ascheid, Antje (2003). Hitler's heroines: stardom and womanhood in Nazi cinema. Temple University Press. p. 46. ISBN 978-1-56639-984-5 . Retrieved 16 December 2011. ↑ Ascheid, Antje (2003). Hitler's heroines: stardom and womanhood in Nazi cinema. Temple University Press. p. 42. ISBN 978-1-56639-984-5 . Retrieved 9 November 2011. ↑ Fox, Jo (2000). Filming women in the Third Reich. Berg. ISBN 978-1-85973-396-7 . Retrieved 30 October 2011. ↑ Wallace, Ian (1 January 2009). Feuchtwanger and film. Peter Lang. p. 141. ISBN 978-3-03911-954-7 . Retrieved 2 November 2011. ↑ Romani, Cinzia. Tainted Goddesses: Female Film Stars of the Third Reich. p. 90. ISBN 0-9627613-1-1. ↑ Romani, Cinzia. Tainted Goddesses: Female Film Stars of the Third Reich. p. 86. ISBN 0-9627613-1-1. ↑ Koch, W. John (July 2004). No Escape: My Young Years Under Hitler's Shadow. Books by W. John Koch Publishing. p. 155. ISBN 978-0-9731579-1-8 . Retrieved 3 November 2011. ↑ Romani, Cinzia. Tainted Goddesses: Female Film Stars of the Third Reich. pp. 84–86. ISBN 0-9627613-1-1. 1 2 3 Romani, Cinzia. Tainted Goddesses: Female Film Stars of the Third Reich. p. 87. ISBN 0-9627613-1-1. ↑ Romani, Cinzia. Tainted Goddesses: Female Film Stars of the Third Reich. p. 93. ISBN 0-9627613-1-1. ↑ Ascheid, Antje (2003). Hitler's heroines: stardom and womanhood in Nazi cinema. Temple University Press. p. 43. ISBN 978-1-56639-984-5 . Retrieved 9 November 2011.